Teacher: Welcome class to the lesson on the style of Alex Lifeson. In this lesson we will cover their "Moving Pictures" era. This was the period when Rush's song writing and progressive rock style came together. Many of the songs got a lot of air play which helped Rush reach a new level in their career. Check out the lesson sample of what you will learn. Teacher: The first section starts off with a harmonic pattern on the guitar that layers the bass and drum tracks. Here's the pattern. Teacher: Harmonic are easy to play if you understand how to use the technique. 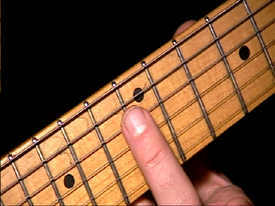 You position your finger directly over the 12th fret (in this case) while barely touching the strings. Here's an example. Teacher: This next picture will show how the finger slightly touches the string. Teacher: In this harmonic pattern you play between the 12th and 7th frets. Harmonics are easy to play over the 3rd, 5th, 7th, & 12th frets. Here's a jam track of part 1. Teacher: Let's move to the next section. You will play a rhythm pattern in A. Teacher: For this rhythm pattern you anchor your 1st finger, barred in the A position on the 2nd fret of the 2nd, 3rd and 4th strings. This allows you to switch quickly to the various inversions of the A chord. You start with an A with a sus4 and back, then you move to playing a C# bass note over the A, then a G note over A and later F# over A. Notice you use the same rhythm variations while you change only the bass notes. Here's the jam tack. Teacher: Practice this pattern a few times and then we will move on. This section will take a little practice, because of the chord variations. Let's move on to the next section. This section uses a combination of power chords and a repeating riff theme. Teacher: You continue to play using a common chord, in this case E, while the bass notes change. 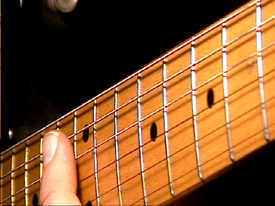 Notice you play the E and B string open (1st & 2nd strings), while you hold down the unison B note using your 4th finger on the 4th fret/3rd string. The unison note helps to thicken up the sound of the chord. Only in bars 3 and 4 do you play a sus2 barre chord, The rest of the phrase uses the unison note combination. Here's the jam track. Teacher: Let's move to the next part, in this section play a riff using an ascending scale pattern. Teacher: In this pattern you start by ascending and descending the C Major scale. Teacher: Later in the phrase you shift the pattern to a relative scale to finish off the riff. Here's the jam track. Teacher: The riff sounds cool when played with the bass and drums. Here's the next part, in this section you play a repeating riff theme in A. Teacher: Notice how the riff pattern shifts up a whole and a half-step in bar 5. Then it shifts back to the original key. Here's the jam track. Teacher: Now you can add a melody over these chord changes. Here's the next part. Teacher: This is a simple melody. Notice you use a half-step bend in bars 2 and 4. You use a hammer/pull-off combination in bars 6 and 8. Here's the jam track for this part. Teacher: Now you can solo over the bass and drum track, first here's the looping jam track you'll use to play over for the upcoming licks. Teacher: Here's the first part of the solo. Teacher: This solo has a cool middle eastern type sound. The scale uses the E Harmonic Minor pattern and relative positions around the main scale. Teacher: Notice how the solo also uses the same scale while descending the 1st string as well. Here's the next part of the solo. Teacher: This section uses the B Phrygian scale with a major 3rd note in bar 2. Bar 3 uses a cool hammer/pull-off combination that also uses the open string to add additional notes. The extra note allows this section to sound faster. Bars 4 & 5 uses the same notes of the scale pattern, but this time descending the 1st string (E). Bars 6 & 7 again use the hammer/pull-off technique on the 3rd string G. This section sounds like Alan Holdsworth. Teacher: Well time to go, see you next lesson!